It’s nice to break away from the usual manga fare every now and then. It gets boring very quickly when most of the stuff you see falls neatly into recognized tropes and generic narrative structures. How many shoujo manga have I now read that featured a plain unpopular girl falling in love with the hot popular guy? Or how many shounen manga have I read that featured over-the-top action scenes and ridiculously overpowered characters? While looking for something different to read a few months back, I happened upon this little gem. There were no monsters to battle and no ridiculous love triangles here. Instead, I was treated to a heartfelt story about the harsh reality of bullying. 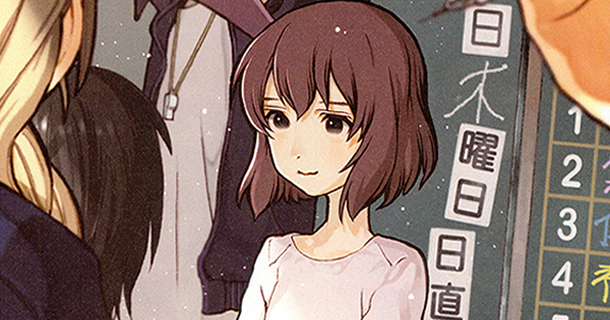 Koe no Katachi is about Shouko Nishimiya, a new transfer student in an unnamed grade school. Despite the fact that she is deaf, she enters public school with an optimistic outlook and hopes to get along with everyone despite her disability. Over time however, the class begins to pick on her because of her disability, looking down on her for what they perceive as being weird and a nuisance to everyone. One particular student, Shouya Ishida, bullies her the most and thinks nothing of it. As the story goes, the bullying intensifies, but to explain what happens next would ruin the impact of the story’s dramatic resolution. From what I’ve read elsewhere, this story had some difficulty getting published due to the nature of its subject matter. Bullying is a serious issue, one that doesn’t get touched upon very often in a medium such as manga. Despite mangaka Yoshitoki Ooima winning the 80th Weekly Shounen Magazine Newbie Best Mangaka Award, there weren’t many magazines willing to publish something that focused on a real issue. Luckily, the one shot was finally published by Bessatsu Shounen Magazine, where it attracted even more attention and went on to receive more accolades. However, it wasn’t until the story was re-published in February 2013 that it attracted widespread attention amongst the manga community, most notably in English speaking countries after it was scanlated online. Bullying is something that really does happen everyday, unfortunately. The psychology of a young child, especially in grade school, is to strive for acceptance within society. Human society looks down on those who are different from everyone else, and is quick to shun them as outcasts for not living up to standards. Even I have experienced bullying back in my grade school days, and I was never quite sure why I was singled out in particular from the other kids. What’s so surprising about this story is how the bullying we see isn’t so far off from what could actually happen in the real world. The ways in which Shouko is bullied were harsh, but what really struck me was the hypocrisy on display. Once things started getting serious, the class was quick to turn on Shouya in order to save their own skin. That kind of selfish thinking is no different than the same kind that drives an angry mob to quickly escalate into violence. Even the teacher showed no signs of sympathy, and although he didn’t have an actual hand in the bullying itself, his uncaring attitude towards her was just as bad. Despite the gloom presented throughout, it does end on an optimistic note. The experiences of bullying drastically affect both Shouko and Shouya, especially with the latter. Karma exists in many forms, and when Shouya becomes the classes’s next target, he learns first hand what it feels to be on the receiving end for a change. Even though he was an instigator for the bullying, he ends up having a change of heart and learning from his mistakes. It’s a message that is both strong and very moving. Messages like that keep me optimistic for society and humanity as a whole. 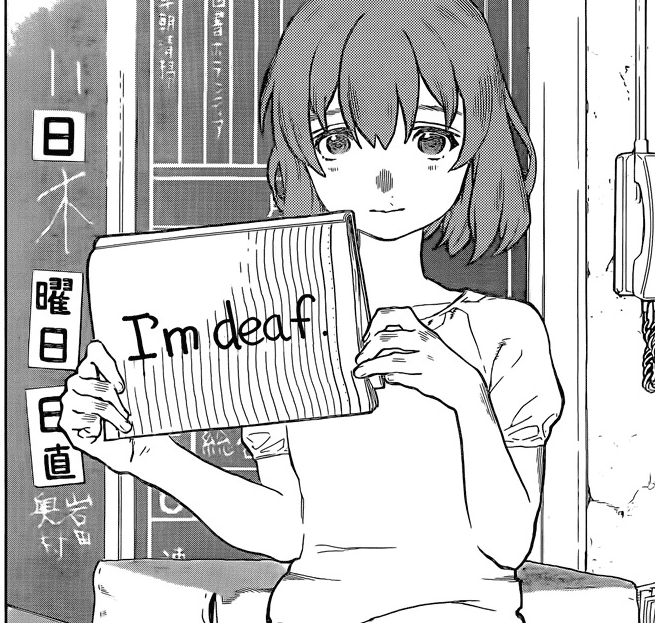 Koe no Katachi made a big splash when it was released, especially after it was put on the web and scanlated for others around the world to see. Its a simple story that resonates with a lot of people for its stark portrayal of bullying. When it was republished earlier this year, it got a lot of attention on the web from people who praised the story for its drama and heartfelt moments. Thankfully, we’ll be able to see more from these characters this month as a fully serialized series is on its way starting this month. 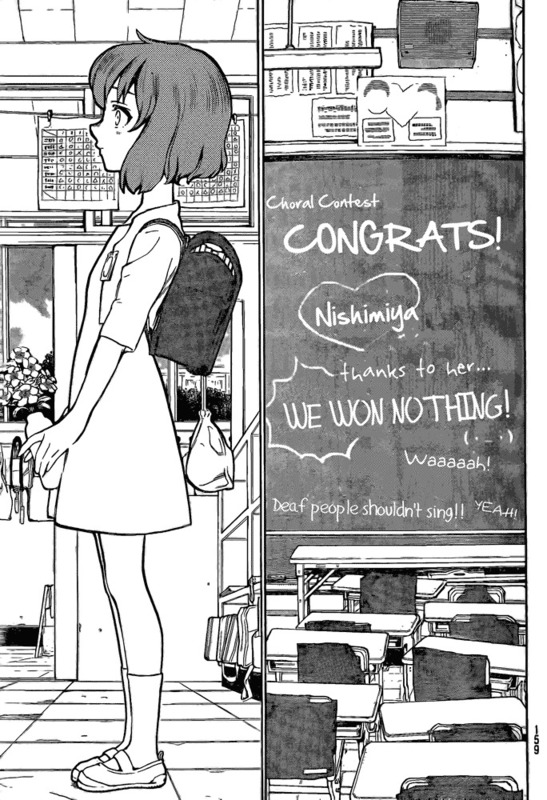 There are very few manga out there with the guts to take on a subject matter as serious and relatable, so I’m glad to see that it’s being given a chance to reach an even wider audience. 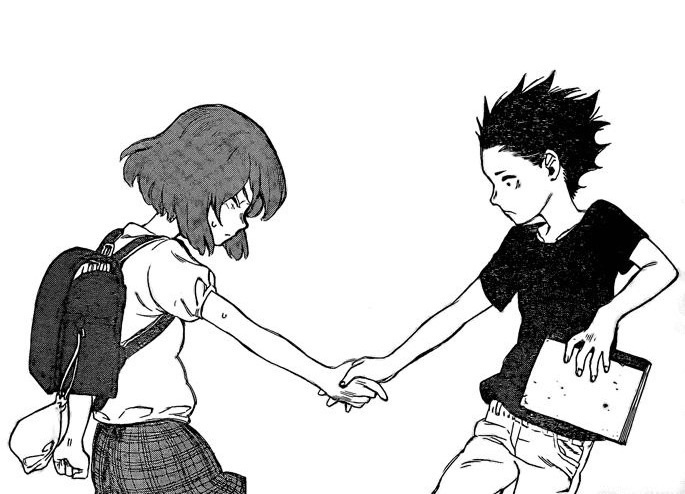 Koe no Katachi is a fantastic read that will tug at your heartstrings through every page, and I hope more people out there will take the time to read it and give it the attention it deserves.